As dark as 'Black Magic' but it has a sheen on the dark leaves Huge leaves Grow indoors or out Easy to grow The plant you will receive is growing in a 4" pot. 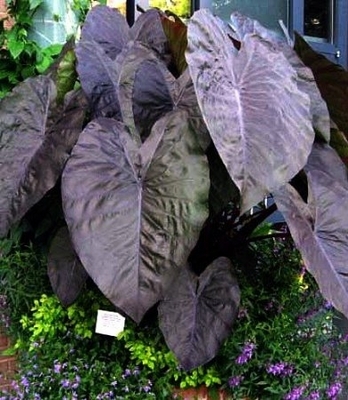 As dark as 'Black Magic' but it has a sheen on the dark leaves The most spectacular Elephant's Ear yet! At 5-6 feet high and wide it's perfect in pots, spreading its graceful foliage over the border; or standing in solitary splendor in partly-shaded gardens. Interplant it with whites for a formal effect, or dress it up with bright green foliage plants and low-blooming flowers, it's great with lavender or pink! This plant has survived to 0 degrees F. without damage. The Diamond Head Elephants Ear also makes a great water plant along the edge of your pond! The Diamond Head Elephants Ear can also be grown year round indoors. Place it in a sunny window and set it in a saucer of water and it will be spectacular! Hardy in zones 7-10. In cooler regions it can be cut back and brought inside as a house plant in the winter. Proper name: Colocasia esculenta 'Diamond Head' The plant you will receive is growing in a 4" pot.